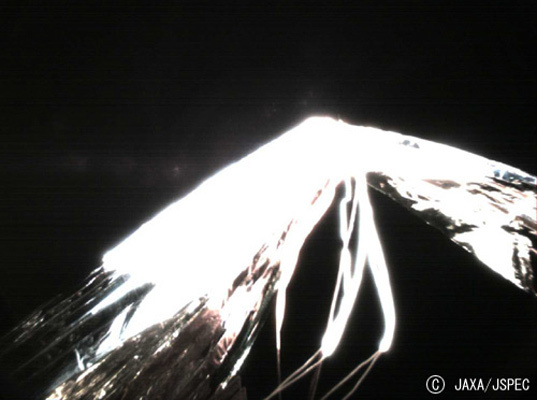 Believers in extraterrestrial life cheered today as the Japanese space agency, JAXA, successfully unfurled a solar sail in space for the first time. Solar sails offer the best hope for deep space exploration because they eliminate the need to carry fuel. Deploying them is no easy task — given, you know, the whole lack of gravity thing — but this morning’s action went off without a hitch. The Japanese spacecraft IKAROS created centrifugal force by spinning, allowing it to launch the .0003-inch-thick sail. While deployment is a challenge in a zero gravity environment, spacecraft — unlike airplanes — don’t have to contend with drag, so with each photon of light that hits the sail, the spacecraft could gather speed. The sail isn’t yet propelling IKAROS; that will be the true measure of the mission’s success. Of course, aliens aren’t the only reason to want to travel through space without carrying rocket fuel. NASA is also working with solar sails to develop ultra-efficient spacecrafts. The Planetary Society (an international space advocacy group funded by private sources) is launching and funding a series of solar sail missions called Lightsail beginning later this year. 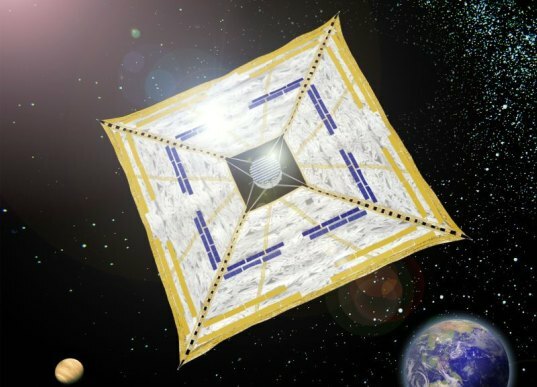 @Lee, the Japanese are working on a hybrid solar sail/ ion drive system such as you mention. Ion drives have been operationally verified. The Lightsail missions will test actual propulsion and navigation. You don't have to wait and hope on goverment actions, get on board, join the Planetary society. By the way, the writer is being sensationalist and silly, this has NOTHING to do with the possibility of extraterrestrial life. It's a propulsion system, for god's sake! I have no idea whether or not any other country has accomplished this feat, but did expect the Japanese to pull it off. Good to know science and a space program continues with such success. Let's hope it will be used for peaceful purposes and continued exploration and learning. I really do hope that this is a successful test of this technology. It really would open up our solar system to exploration on a grand scale and with realistic travel times. The idea of combining solar cells with the sail is a brilliant one, giving more energy for the unit area. Of course the electricity if used for propulsion would need a 'fuel' supply.....hydrogen or some kind of accelerable matter. Some could be carried onboard in tanks, and some could be collected by the sail itself! Believers in extraterrestrial life cheered today as the Japanese space agency, JAXA, successfully unfurled a solar sail in space for the first time. Solar sails offer the best hope for deep space exploration because they eliminate the need to carry fuel. Deploying them is no easy task — given, you know, the whole lack of gravity thing — but this morning's action went off without a hitch.